In 1521, Suleiman the Magnificent, ruler of the Ottoman Empire at the height of its power, dispatched an invasion fleet to the island of Rhodes. It was to prove the opening shot in an epic struggle between rival empires and faiths for control of the Mediterranean that consumed the centre of the world for sixty years. Empires of the Sea tells the story of this great contest. It is a fast-paced tale of spiralling intensity that ranges from Istanbul to the Gates of Gibraltar and features a cast of extraordinary characters: Hayrettin Barbarossa, the pirate who terrified Europe, the risk-taking Emperor Charles V, the Knights of St John, last survivors of the crusading spirit, and the brilliant Christian admiral, Don Juan of Austria. Its brutal climax came between 1565 and 1571, six years that witnessed a fight to the finish, decided in a series of bloody set pieces: the epic siege of Malta, the battle for Cyprus and the apocalyptic last-ditch defence of southern Europe at Lepanto, which fixed the frontiers of the Mediterranean world that we know today. Empires of the Sea is the sequel to Roger’s Crowley’s much-praised, Constantinople: The Last Great Siege. It is page-turning narrative history at its best – a story of extraordinary colour and incident, rich in detail, full of surprises and backed by a wealth of eyewitness accounts. Its denouement at Lepanto is a single action of quite shocking impact: Cervantes called it ‘the greatest event witnessed by times past, present and to come’. The book is also a narrative about technology and money. Lepanto was the Mediterranean’s Trafalgar, the last and greatest moment in the age of the galleys before sailing ships with broadside guns swept all before them, and it was paid for, on the Christian side, with Inca gold. "Crowley’s thrilling descriptions of the siege of Malta and the epic battle of Lepanto are so vivid you can almost hear the ring of steel and taste the tang of the sea." "...a thrilling tale by a gifted historian." "This bestseller is so brilliantly written that it will immediately grip even those least likely to be fans of 16th-century history." "…the merits of Crowley’s book are those of narrative skilled and balanced empathies. The changing pageant of tactics and weaponry, the pendulum of power and morale make for compulsive reading." "Amazing narrative power as well as an even-handed approach to the grisly horrors endured by Christians and Muslims alike." "This rousing account … has everything … Crowley is a former publisher rather than a fully fledged academic, but his scholarship is sure-footed, and his narrative skills an old-fashioned delight." "In 'Empires of the Sea,' British historian Roger Crowley brings a keen grasp of early modern warfare and a gift for vivid writing to his absorbing and relentlessly bloody account of the conflict. Crowley has a fine eye for both the broad outlines of grand strategy and the horrific details of combat, as well as for the dramatis personae who shaped the conflict"
"Empires of the Sea, Roger Crowley's page-turner history of the battle for control of the Mediterranean in the 1500s, deserves to be this summer's most recommended nonfiction book… he has a firm grasp of the essentials of historical narrative: place, character and action. Empires of the Sea is first-rate popular history and an excellent background to today's religious wars… Rich in character, action, surprise, what transpired in those few desperate weeks is one of history's best and most thrilling stories." "I have already mentioned how well Mr. Crowley tells a story; but he does much more than that. His analyses of the political and economic background to the events he describes so brilliantly are intelligent and perceptive, and he is a superb portraitist. We are left with clear and unforgettable pictures of all sorts of figures from this great drama, including Süleyman, Charles V, the Grand Masters of the Knights of St. John, the pirate Barbarossa and Pope Pius V. I enjoyed every page of "Empires of the Sea" and was sorry indeed when I turned the last one." "The sieges of Malta and Famagusta were spectacularly violent affairs and are described to dazzling effect by Crowley (who performed the same trick in his 2005 Constantinople: the Last Great Siege). He is excellent at conveying the frustrations of the Ottoman forces, deluded in their expectations of swift victory, as well as the growing fear of the besieged Christians as they contemplated a bloody end…This is a first-class narrative history, splendidly illustrated with old-fashioned engravings. Crowley is just as scintillating when outlining the complex geopolitics of the 16th-century Mediterranean as when he is cataloguing the awful wounds and injuries sustained in the various battles." "Empires of the Sea confirms Crowley as master of the Mediterranean between 1521 and 1580, marshalling his understanding of men and tides as brilliantly as any of the Ottoman corsairs or crusading sea-dogs he writes about so knowledgeably and enjoyably...Roger Crowley builds towards the great battle with consummate dexterity. From Rhodes to Malta, he handles the great set-piece battles with the attention to detail and grasp of strategy he displayed so brilliantly in Constantinople. Empires of the Sea is an exciting book, in which you feel the scorch of the arquebus, the perils of the sea and the frustrations of an Ottoman pasha or a Pope as vividly as the springs in your comfortable armchair." "Masterfully synthesizing primary and secondary sources, he vividly reconstructs the great battles, Malta and Lepanto, that shaped the struggle and introduces the larger-than-life personalities that dominated council chambers and fields of battle." "There is a certain British genius for Boys’ Own Paper military history, and Roger Crowley has it….It can be read as you might read Bernard Cornwell’s Sharpe novels and the momentum would easily carry you through a plane journey. But it is also a work with serious research behind it, and a contribution to quite an important and even topical subject." "This is narrative history at its most gripping..."
"A masterly narrative that captures the religious fervor, brutality and mayhem of this intensive contest for the “center of the world." "...this magnificent new narrative history...Crowley shows a novelist's eye for vivid scene-painting." "Roger Crowley’s Empires of the Sea recounting the 16th-century struggle for mastery of the Mediterranean between Christian and Ottomans, is nothing less than thrilling." "...a riveting account of a bitterly contested political, ideological and economic conflict whose effects are still with us. Narrative history at its best." 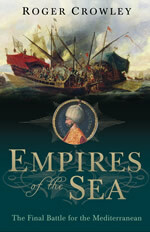 "...a gripping account of the battle for the Mediterranean in the 16th Century." "Americans today know little about the long struggle between Christian Europe and militant Islam, and for this reason alone "Empires of the Sea," Roger Crowley's page-turner history of the battle for control of the Mediterranean in the 1500s, deserves to be this summer's most recommended nonfiction book.... Rich in character, action, surprise, what transpired in those few desperate weeks is one of history's best and most thrilling stories." "From the outset, Crowley's research is thorough and exact. He liberally provides key Christian eye-witness accounts from the period, detailing the royal and diplomatic uncertainties, and underscoring the huge anxieties of the age. 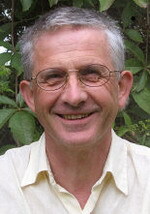 Crowley also offers exquisitely delicate insights and undulating descriptive passages. Yet in his descriptions of the battles, his prose is so taut and tense, it is impossible not to be caught up in the harrowing action. Though he never revels in gore, the unadorned facts invariably produce cover-your-eyes, heart-thumping moments.... It is rare that a book comes along which requires us to reconsider our verdicts on the past. Crowley's “Empires of the Sea” is an honest history of an underestimated and oft-neglected subject and it is certainly one of those rare books. "